Infant and young child feeding practices have substantial consequences for the growth, development, and survival of children. Children should be exclusively breastfed for the first 6 months of life and thereafter continue to breastfeed for 2 years or longer. Children are vulnerable to malnutrition thus nutrition and health status of the confined children is of interest. The purpose of this study was to establish feeding practices of children 0-59 months incarcerated with their mothers in selected women’s prisons in Kenya. A cross-sectional analytical study was conducted on an exhaustive sample of 202 children and 193 mothers, drawn from a sample of eight out of the 35 women prisons in Kenya. Data collection tools included: a structured researcher-administered questionnaire for mothers and children. Exclusive breastfeeding rate was 69.4%; continued breastfeeding at 1 and 2 years year (88.5%; 52.2%). The mean Dietary Diversity Score (DDS) was 3.52 ± 1.04 foods groups out of 7 groups with 53.3% having attained the minimum DDS and 86.5% of breastfed children having attained the minimum frequency meal consumption. About half of the children (48.6%) attained the minimum acceptable diet. In terms of nutritional status, 21.4% of the children were stunted, 3.8% wasted and 7.5% were underweight. Dietary practices were associated with underweight; not attaining the minimum dietary diversity and minimum acceptable diet was associated with underweight (p = 0.012; p = 0.014); Illness 2 weeks prior to the study was correlated with underweight (p=0.012). Feeding practices significantly influenced nutritional status among children accompanying incarcerated mothers in prisons in Kenya. Keywords: Dietary practices, Nutritional status, Incarcerated children, Morbidity. open-access license: This is an open access article licensed under the terms of the Creative Commons Attribution-Non-Commercial 4.0 International Public License (CC BY-NC 4.0)	(https://creativecommons.org/licenses/by-nc/4.0/legalcode), which permits unrestricted, non-commercial use, distribution and reproduction in any medium, provided the work is properly cited. In many countries and in nearly all the regions, the female prison population has increased dramatically over the last ten years. The vast majority of detained and imprisoned women are mothers, and often the sole or main caretaker of minor children [1MWomen in Prison: a commentary on the Standard Minimum Rules for the Treatment of Prisoners 2005. (discussion draft – final version forthcoming)]. Children of imprisoned women can be categorized into two: those who are separated from their mothers while she is imprisoned, and those who go into prison with their mothers [2Babies and small children residing in prisons. Human Rights and Refugee Publication 2005; pp. 1-5.]. Internationally it is not uncommon for a child to spend some of his or her childhood in prison during the parent’s prison sentence [3Poso T, Rosi E, Tarja V. Children residing in prison: An example of institutional invisibility. Prison J 2010; 90(4): 516-33. [http://dx.doi.org/10.1177/0032885510382227] ]. For instance, in Kenya, 4,053 and 3,348 children under the age of 4 years spent some time in prisons in the year 2005 and 2009 respectively [4 Republic of Kenya. Kenya Gazette Legislative Supplement No 21: Legal Notice No. 540, First schedule A. Government Printers, Nairobi, 2009, p. 1282. ].Under Cambodian law for example, children are allowed to stay with their mothers in prison until the age of six. In cases where alternative care is not available, this age limit is nevertheless flexible and some children beyond the age of six do live with their detained mothers [5Comité International de l'Ordre de Malte Helping children living in prisons. Annual Report 2008; pp. 1-4.]. In Cambodia, the daily budget per prisoner amounts to Riels 1,500 (about USD 0.35) and no budget is foreseen for accompanying children or for pregnant women whose child will be born in prison [5Comité International de l'Ordre de Malte Helping children living in prisons. Annual Report 2008; pp. 1-4.]. Whereas, in Germany, where the prison system is more open and professionals stress the importance of mothers personally caring for their children for as long as possible, children up to three, four or six years old can live in prison with their mothers [6Oliver R. Children imprisoned by circumstance. Human Rights and Refugee Publication 2008.]. Consequently, in the UK, the upper limit for children living in prison is 18 months [6Oliver R. Children imprisoned by circumstance. Human Rights and Refugee Publication 2008.]. In Iceland on the other hand The Icelandic Execution of Sentences Act stipulates that, “(i)f a woman has an infant child when she begins serving her sentence, or if she gives birth to a child during her term of imprisonment, she may be permitted, in consultation with a Child Welfare Committee, to have the child with her in prison”. The accompanying Enforcement of Sentences Regulation further prescribes that the upper age limit for a child in prison is eighteen months, as a stay thereafter is considered harmful to the child. Additionally, children younger than eighteen months undergo an evaluation by the Child Welfare Committee to determine if a stay in the prison is in their best interest. Inmates enjoy the same health care benefits as the public at large. This includes access to prenatal and postnatal care [2Babies and small children residing in prisons. Human Rights and Refugee Publication 2005; pp. 1-5.]. Concerning incarceration in Kenya, The Kenya Prisons Act section 30 [4 Republic of Kenya. Kenya Gazette Legislative Supplement No 21: Legal Notice No. 540, First schedule A. Government Printers, Nairobi, 2009, p. 1282.] states; “The infant child of a female prisoner may be received into prison with its mother and may be supplied with clothing and necessaries at public expense: Provided that such child shall only be permitted to remain in prison until it attains the age of four years or until arrangements for its proper care outside prison are concluded, whichever shall be the earlier” [4 Republic of Kenya. Kenya Gazette Legislative Supplement No 21: Legal Notice No. 540, First schedule A. Government Printers, Nairobi, 2009, p. 1282.]. This act does not give any special treatment to nursing mothers or any considerations regarding child feeding subjecting both the mother and child to various forms of malnutrition [4 Republic of Kenya. Kenya Gazette Legislative Supplement No 21: Legal Notice No. 540, First schedule A. Government Printers, Nairobi, 2009, p. 1282.]. Israel on the other hand, Under the Prison Authority directives, pregnant inmates and infants under the age of two who are in prison enjoy medical supervision and treatment, including prenatal care for expecting mothers and appropriate nutrition and immunizations for both mothers and children [2Babies and small children residing in prisons. Human Rights and Refugee Publication 2005; pp. 1-5.]. Nutrition has a great influence in a child’s life and feeding practices have a direct impact on the nutritional status and the well-being [7Malla S, Shrestha SM. Complementary feeding practices and its impact on nutritional status of under two Old children in urban areas of the Kathmandu, Nepal. Nepal Health Res Council 2004; 2(1)]. Conditions in Kenyan prisons have been decried on various fronts [8The state of the world’s human rights Kenya. Harsh Prison Conditions and Deaths in Custody 2005; pp. 149-51.]. Consequently children living under prison conditions are vulnerable to malnutrition if appropriate feeding and healthcare practices are not put in place. A study by Omukhweso (2007) in the prisons in Kenya established the prevalence of wasting to be 8.9%, underweight 14.1% while stunting was 18.8% among children 0-59 months. Kenya has on average about 300 children between 0-59 months living with incarcerated mothers in the 35 women prison country world. Information on the status of feeding practices is scanty despite international agencies classifying these children as being under difficult circumstances [9WHO. Impact of early initiation of exclusive breastfeeding on new born deaths. A&T Technical Brief, 2010; pp. 1-6.]. Adequate information regarding the nutritional status of children accompanying their mothers in prisons in Kenya is also scanty. It is therefore imperative to investigate the feeding practices and nutritional status of children incarcerated with their in prisons. A cross-sectional analytical study was undertaken during the months of June and July 2011 in eight Kenyan women’s prisons all purposively sampled. This study targeted children aged 0-59 months. The mothers of these children who were incarcerated at the time of study in the selected 8 women prisons in Kenya were the respondents. All the children 0-59 months who met the inclusion criteria were included in the study. The calculated sample size was 206. This was calculated based on Fisher et al., 1998 formula (n = Z2 pq ÷ d2)). A total of 193 mothers were interviewed and included in the study. The main data collection instrument was an interviewer-administered structured questionnaire. It was used to collect socio- demographic information, feeding practices, morbidity and anthropometric data. Focus group discussion guide, key informant interview schedules and researcher observation checklist were used to gather information on experiences and challenges on feeding practices, medical care, water and sanitation and other relevant concerns attributable to this study. Data on feeding practices was collected using a 7 day food frequency questionnaire and 24 hour dietary recall. The dependent variable for this study was the nutrition status of children 6-59 months old. The nutrition status was based on weight for height/length (wasting), weight for age (underweight), height/length for age indices (stunting), and presence/absence of oedema. The independent variables included the IYCF practices which were assessed using the WHO (2010) recommended 8 core indicators, health care practices (deworming, health seeking behavior, vitamin A supplementation, immunization), morbidity prevalence among the children and socio-demographic status of the mother. Anthropometry data was analyzed using ENA for SMART (2008). Data on dietary intake was analyzed using Nutri-Survey software, after which it was exported to SPSS for cross analysis. Descriptive statistics were used to describe data on nutritional status, feeding practices, maternal socio-demographic characteristics and morbidity prevalence. Pearson product moment correlation coefficient was used to show relationship between continuous. Chi-square tests were performed to establish the relationship between the socio- demographic, morbidity and dietary intake and the nutritional status of the children. Significance level was set at ≤ 0.05. The youngest mother in this study was aged 17 years while the oldest was aged 55 years. The mean (SD) age was 27.7 ±6.33 years. The majority of the mothers (97.4%) were aged between 19-55 years (Table 1). Slightly more than half (50.3%) of the mothers were reported to have been married before incarceration. Education level ranged from no-formal schooling to university with close to two thirds (63.7%) of mothers having primary level education while slightly more than one-quarter (26.9%) had secondary education. The main occupation practiced by (31.1%) of the respondents while out of prison was petty trade, with close a one third (29%) being involved in crime related occupations like drug trafficking, prostitution, robbery with violence and trading in illicit brew. The majority (71%) of the mothers were in incarceration for a period of between 1 to 12 months. The mean (SD) duration of confinement was 11.7± 11.4 months. In this study, more than half (58.5%) of the mothers were convicted while (41.5%) were awaiting trial or sentences for various offences (Table 1). Information on the length of sentence for those who had been sentenced at the time of data collection and crimes committed was not obtained since this was not the main objective of the study. Maternal characteristics in selected prisons. There was no significant difference in the number of male and female children. Males were 51% while females were 49% (p-value 0.05). The findings in this study revealed slightly more than a third (34.7%) (Table 2) of the children were in the age group 6-17 months. Characteristics of the study children. In this study, more than half (53.1%) of children were initiated to the breast within one hour of birth with (43.8%) being initiated within 24 hours of birth (Table 3). A small proportion (0.8%) of respondents could not recall initiation time. Based on a 24 hour recall (69.4%) of infants less than 6 months; were exclusively breastfed. The prevalence of continued breastfeeding at 1 year was 88.5%. Continued breastfeeding for two years or beyond among children 18-23 months old was prevalent among slightly more than half (52.2%) of the children. Breastfeeding practices for children 0-23 months. The findings of this study showed that most of the children between 6-8 months old, (92.3%) had been introduced to solids, semi-solids or soft foods. Minimum dietary diversity is defined by the proportion of children between 6-23 months who received food from 4 or more food groups in the past 24 hours. In this study slightly more than half (53.3%) of children 6-23 months were reported to have consumed foods from ≤ 4 food groups (Table 3). The mean (SD) dietary diversity score was 3.52 ± 1.04. The findings of this study revealed that (100%) of breastfed children aged 6-8 months met the recommended minimum meal frequency (Table 3). Of the breastfed children aged 9-23 months old, 82.9% met the recommended meal frequency of three or more meals in a day. About two fifths (38.9%) of the non-breastfed children ages 6-23 months old met the recommended minimum meal frequency while breastfed children who met minimum acceptable diet were close to half (48.6%). Slightly more than half (53.5%) of study children were reported ill based on a two-week recall. The duration of illness was between one to fourteen days. Many (43.7%) of the sick children had illnesses lasting for less than three days. In this study, more than two thirds (76.9%) of reported illnesses were associated with upper respiratory tract infections. About two-fifths (39.8%) of the children’s cases of illnesses were coughs and runny nose reported by 11.1% (Table 4). Morbidity pattern among children 0-59 months old and maternal health seeking behaviour. More than two fifth (89.8%) of mothers, sought medical help for the sick children within 24 hours of illness. Slightly more than a third (36.4%) of those who did not seek medical attention felt the illness was mild. The same proportion of mothers did not see the importance of seeking health services because in their view the treatment offered was blanket not based on proper diagnosis (Table 4). The majority (79.4%) of mothers who sought medical help for their sick children did so in the dispensaries within the prison grounds. In this study the wasting rate was 3.8% (95% CI: 1.4 – 9.6), underweight 7.5% (95% CI: 4.1 – 13.5), and stunting rates of 21.4% (95% CI: 12.4 – 34.2), (Fig. 1 ). None of the children presented with oedema. Significant correlation existed within the forms of malnutrition, underweight was significantly associated with stunting at (r = 0.316 p-value < 0.000). On the other hand underweight was significantly associated with wasting at (r= 0.443 p-value < 0.000). In this study, nutritional status (underweight) showed a significant negative relationship with meal frequency (p- value 0.030). Based on this index, those children who had adequate meal frequency were more likely to be underweight. Three quarters (75%) of the children who were underweight, met the WHO recommendation for frequency of feeding. Stunting and wasting did not show any significant relationship with this indicator (Table 5). Meal frequency and nutritional status cross tabulation. 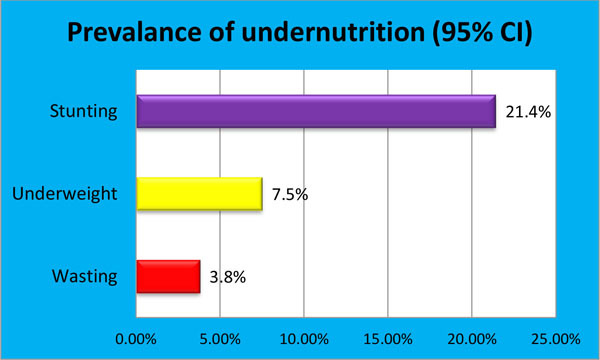 Distribution of under nutrition among children 6-59 months old. The majority (87.5%) of the underweight children was those not consuming the recommended 4 or more food groups. There was a significant relationship between dietary diversity and nutritional status based on underweight. Children who were underweight were more likely to consume a diet not meeting the minimum acceptable dietary diversity score (chi-square test; p = 0.012). Stunting and wasting did not show any significant relationship with dietary diversity. Children not meeting the recommended minimum acceptable diet in this study were more likely to be underweight. More (87.5%) of underweight children did not meet the recommended minimum acceptable diet. Underweight showed a significant relationship with this indicator at Chi-square test; p= 0.014 (Tables 6 and 7). This IYCF indicator did not show any significant relationship with stunting and wasting. Dietary diversity and nutritional status cross tabulation. Weight-for-age index showed a significant relationship with the presence of illness (p=0.012). The majority (91.7%) of the children who were sick were also underweight. Wasting and stunting did not show any significant relationship with the episode of illness in this study (Table 8). Minimum acceptable and nutritional status relationships cross tabulation. Relationship between morbidity and nutritional status (WFA). The findings of this study showed that a few teenage mothers were confined in adult prisons. These findings are in agreement with the observation that the number of girls in the juvenile justice system has increased dramatically in recent years despite the fact that the proportion of girls in prison within the women’s prison population is low [10Bastick M, Townhead L. Women in prison: a commentary on the UN minimum rules on the treatment of prisoners. Human Rights and Refugee Publication 2008; pp. 8-11.]. In the United States of America, for instance, girls currently comprise about 25% of the total population in juvenile justice facilities. Most of the mothers in this study were aged between 19 and 55 years. The findings of this study compare with those by Omukhweso (2007) conducted in selected women prisons in Kenya indicating that most mothers in prison are young. Most of the children accompanying their mothers at the time of study were those below the age of 48 months as permitted by the constitution. Nevertheless, a few children were above this age limit and social workers were in the process of placing them in suitable children’s homes until such a time when the mother is released from prison. However in cases where the mother identifies a suitable relative to care for the child, such relatives is taken through a rigorous vetting process and if found suitable the child is handed over to them till the mother is released from custody. The findings in this study showed that more than half of the children were initiated to the breast within one hour of birth. The results do not differ much from those of general population in Kenya 58% [9WHO. Impact of early initiation of exclusive breastfeeding on new born deaths. A&T Technical Brief, 2010; pp. 1-6.]. This is because most of the children are delivered in the same hospitals as the general population thus subjected to the same health services. Based on a 24 hour recall most of the infants less than 6 months of age in this study had been exclusively breastfed. Exclusive breastfeeding rate in this study was higher than the national rate for general population in Kenya at 32% [11Kenya National Bureau of Statistics & ICF MacroKenya Health and Demographic Survey. Calvarton, Maryland: KNBS and ICF Macro 2010.]. This is probably because of the relatively small sample size in this study. The higher prevalence of EBF in prison may also be attributed to the support given to mothers with infants 0-3 months. The findings of this study differ with those by Omukhweso [12Omukhweso SO. The relationship between prison conditions and the nutrition status of the children accompanying their mothers in prisons in Kenya unpublished thesis. University of Nairobi, Kenya 2007. ] where EBF was practiced by a minority. This may be as a result of reforms undertaken in prison in recent years after Omukhwesos’ study. [http://dx.doi.org/10.1186/1471-2458-11-396] ]. In prisons in Kenya, children are served with porridge as the main breakfast meal. Slightly more than half of the children met the recommended minimum dietary diversity of four or more out of seven food groups. The findings compare with the Kenya national rate of 58% of the children 6-23 months old having attained the minimum dietary diversity [11Kenya National Bureau of Statistics & ICF MacroKenya Health and Demographic Survey. Calvarton, Maryland: KNBS and ICF Macro 2010.]. The frequency of feeding is an important indicator for the attainment of adequate dietary intake and therefore health and nutritional status. In all the prisons visited the children were served with 3 meals and at least 2 snacks per day. Therefore meeting the recommended meal frequency in prison set up among the breast-fed children was not an area of concern. Of concern is the frequency of meals served to non-breastfed children, who ate the same number of meals as their breast-fed counterparts despite the fact that they need to eat more times since they do not get additional nutrients from breastfeeding. No special consideration is given to these children. The most common childhood illnesses reported by the majority of mothers were those related to the acute respiratory tract infections (ARI). This could be associated to harsh prison conditions such as overcrowding and exposure to extreme temperatures especially at night. None of the prisons isolated a child when sick. Other aggravating factors cited during the focus group discussions were; lack of beds within the cells for mothers with babies. Langata women prison was the only facility with beds in the cells (Observation by the research team June 2011). Children lacked warm clothing exposing them to excess cold weather at night and during cold seasons, dusty and cold floors within the cells; congestion in some facilities (Reports from FGDs, June/July 2011). Similar observations were reported by Omukhweso (2007). The prevalence of diarrhoeal diseases and vomiting was also common and could be associated with inappropriate sanitary habits according to the FGDs with the mothers. Only a small proportion of children had access to treated/boiled drinking water. Caretakers reported the failure to wash hands before feeding the children. The use of soap was found to be uncommon in the practice of washing of hands. These factors increased the risks of contamination. The study found that in the event of sickness, nearly all the children (91.7%) of the children were taken to the prison dispensaries for medical care. Each prison was found to have its own dispensary situated on the male (main) wing of the prison except in the case of Langata prison which is purely a women’s prison. Through key informant interviews, it was established that the drug kits in the dispensaries were supplied by the Ministry of Public Health and Sanitation or Ministry of Medical Services which also seconded its technical staff to work in the prison dispensaries. The drugs supplies were done by the government. In case where there were no drugs in the health facilities, the prison administration or the prisoners themselves or well -wishers purchased the drugs. However, all the administrators conceded that the money allocated by the government for pharmaceuticals and non-pharmaceuticals was not sufficient. More than half of the respondents concurred that prisons were faced with frequent essential drugs stock outs. Nevertheless the majority of mothers were satisfied with the quality of health care within the prison dispensaries and the civilian referral hospitals. 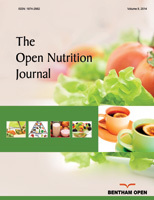 In this study, achievement of the minimum dietary diversity, minimum meal frequency and minimum acceptable diet is associated with better nutritional status of children. Feeding practices significantly influenced nutritional status among children accompanying incarcerated mothers in prisons in Kenya. The results of this study will guide the government and other stakeholders in to formulate policies that govern the health care and feeding practices of children incarcerated with their mothers in prisons. The policies should strive to improve the feeding practices of children accompanying the mother to prison, by allocating budgets to cater for the child and the mother. Improved health care provisions, sleeping arrangements, psychosocial support, and alternative care for the child where this may be possible, and provisions of basic commodities for the child like bathing soap, diapers, among other things. The following recommendations are made based on the study findings. The prisons authority should allocate duties to mothers with children below six months of age duties within the prison grounds to allow them to continue with exclusive breastfeeding for their children. The Ministry of Public Health and Sanitation should train the Kenya Prisons Officers-In-Charge of women prisons on IYCF; as a way of improving such practices in prisons. The Ministry should also solicit for and provide funding to facilitate the provision of appropriate health and nutrition services for children accompanying their mothers in prisons. The Prison Authority in conjunction with the Ministry of Health should carry out monthly growth monitoring to detect early onset of malnutrition among children 6-59 months of age for timely intervention to reduce on cases of malnutrition. The Prison authorities should provide children with safe, clean drinking water and toilet facilities to reduce cases of diarrheal and other related illnesses. Other stakeholders dealing with children issues such as UNICEF and Human Rights Commission should assist the government in lobbying and providing the appropriate services to women prisons holding children. These services include but not limited to, beds and beddings, warm clothing, diapers or napkin, toiletries especially soap and oils, potties for young children and play equipment for the day care centers. The Ministry of Public Health and Sanitation should deploy nutrition officers to provide nutrition information to incarcerated mothers and their children. The nutrition officers should also facilitate the formulation of appropriate menus and to make in put to the budget allocation for provision of meals for the children. The nutritionist should ensure children are regularly growth monitored and dietary diversity and meal frequencies are improved. Ministry Of Health to ensure that the children and their mothers have access to Maternal and Child Health services. The Ministry of Public Health and Sanitation to categorize children in prisons among children under difficult circumstances and accord them the necessary provisions provided for the children under such circumstances. The government should formulate policies that govern the stay of children in prisons in Kenya. Such policies should include provision of quality health care and nutrition. Women offenders with young children should be provided with free bond or sentences that involve community service where applicable. This is in a bid to reduce the increasing number of young children in prisons in Kenya. In the new Constitution, children have the right to a name and nationality, free and compulsory basic education, basic nutrition, shelter and health care. Furthermore, Kenya is a signatory of the International Human Rights Commission of which Kenya. The Kenya government should therefore ensure the rights of children in prisons are not violated. The authors acknowledge the study population for their willingness to respond to data collection tools. The authors also thank the research institutions for their cooperation and support during the study period. Babies and small children residing in prisons. Human Rights and Refugee Publication 2005; pp. 1-5. Poso T, Rosi E, Tarja V. Children residing in prison: An example of institutional invisibility. Prison J 2010; 90(4): 516-33. Republic of Kenya. Kenya Gazette Legislative Supplement No 21: Legal Notice No. 540, First schedule A. Government Printers, Nairobi, 2009, p. 1282. Comité International de l'Ordre de Malte Helping children living in prisons. Annual Report 2008; pp. 1-4. Oliver R. Children imprisoned by circumstance. Human Rights and Refugee Publication 2008. The state of the world’s human rights Kenya. Harsh Prison Conditions and Deaths in Custody 2005; pp. 149-51.
 WHO. Impact of early initiation of exclusive breastfeeding on new born deaths. A&T Technical Brief, 2010; pp. 1-6. Bastick M, Townhead L. Women in prison: a commentary on the UN minimum rules on the treatment of prisoners. Human Rights and Refugee Publication 2008; pp. 8-11. Kenya National Bureau of Statistics & ICF MacroKenya Health and Demographic Survey. Calvarton, Maryland: KNBS and ICF Macro 2010. Omukhweso SO. The relationship between prison conditions and the nutrition status of the children accompanying their mothers in prisons in Kenya unpublished thesis. University of Nairobi, Kenya 2007.